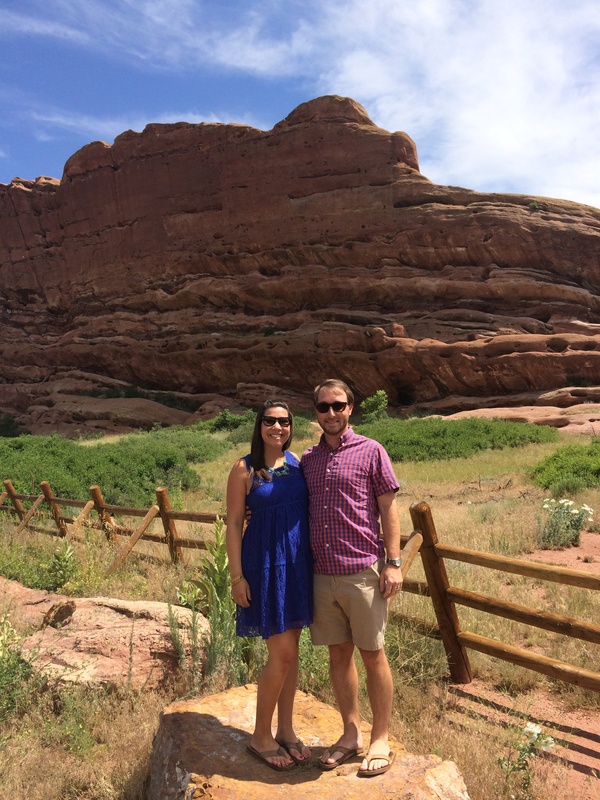 So, I’ve been slacking a bit on the blog lately. Mike and I took off this past week for a much needed getaway at the beach! 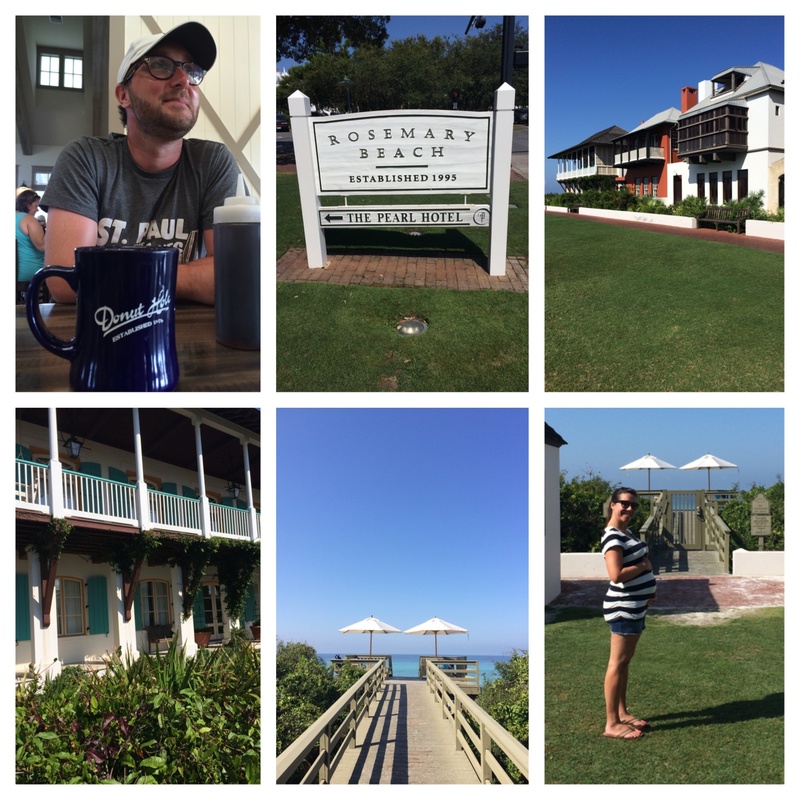 We headed to Blue Mountain Beach, FL – near where we got married – for 5 fabulous days with my family. 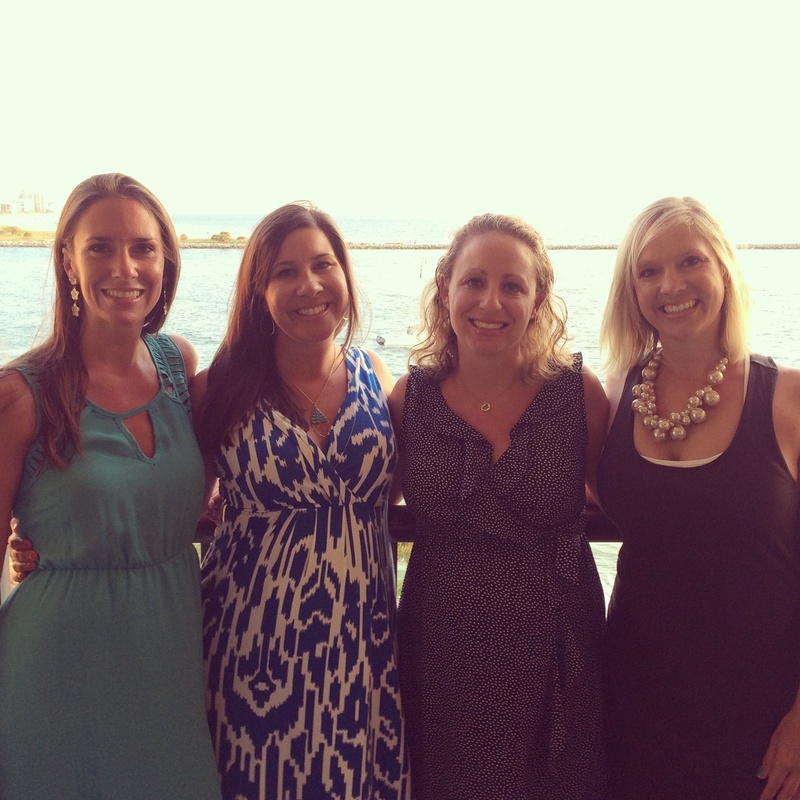 We then drove to Tampa on Thursday to spend the rest of the weekend with my best friends from college. 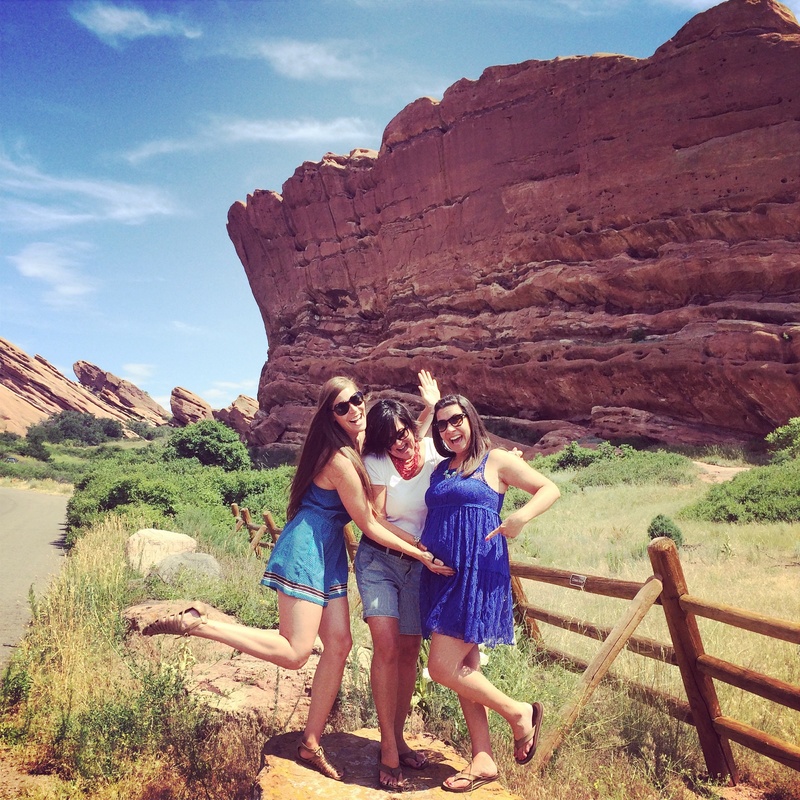 The four of us are only able to get together about once a year these days, so we really cherish these fun weekends. We had such a wonderful week, and I’m sad that it’s already come to an end. 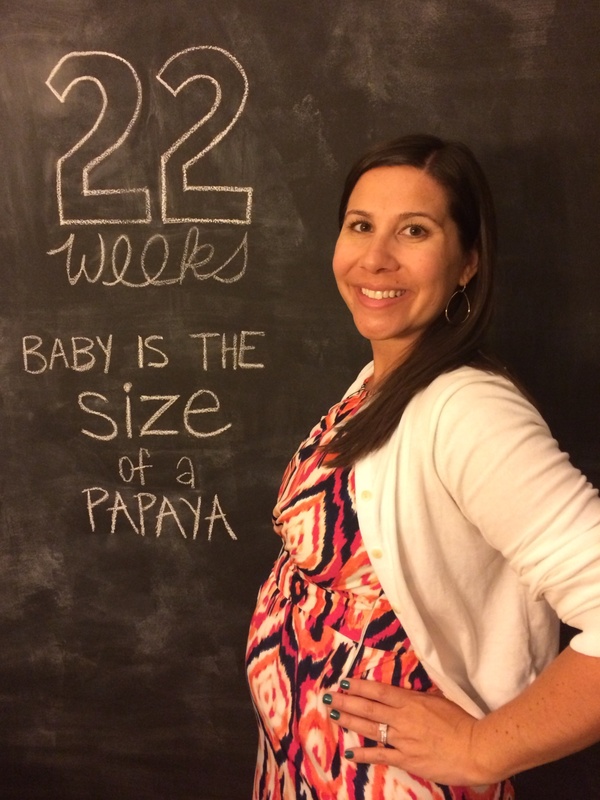 Because we left a day before I hit 24 weeks, I decided to just combine these past two weeks into one blog post. 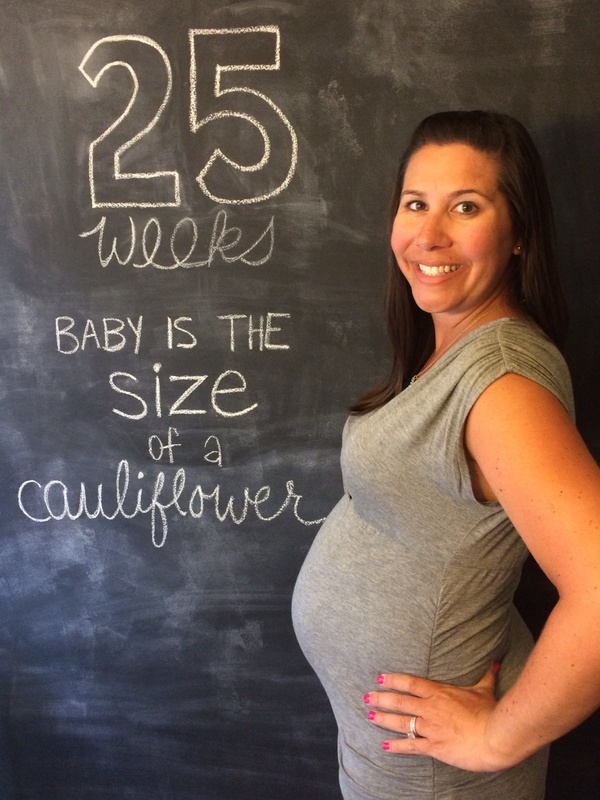 How far along: 25 weeks and the size of a head of cauliflower – about 14 inches long and 1.5-2.2 pounds. 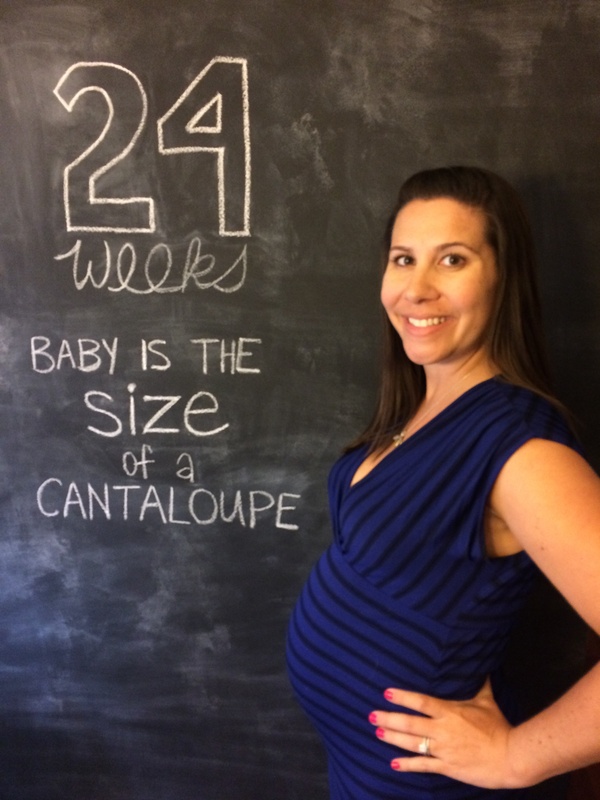 How far along: 24 weeks (23 weeks, 6 days) and the size of a canteloupe – more than 12 inches long and just over a pound. Maternity clothes: I finally wondered into Motherhood Maternity the week before our vacation, and I added a few new pieces to the wardrobe – mostly work attire. Belly button in or out: Looking pretty flat these days. Sleep: I made the decision to load up my Snoogle in the car for our road trip since we would be gone for over a week, and I’m so glad I did! I’ve become pretty dependent on that thing as my belly continues to expand. 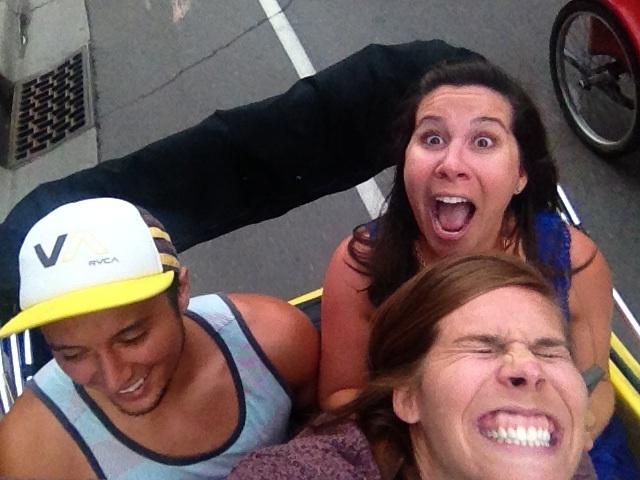 Best moment this week: So hard to choose after such an amazing week. Sitting on my favorite beach is really hard to beat, but spending quality time with my family and closest friends is the best! Cravings: The usual suspects… cantaloupe, watermelon, ice cream. 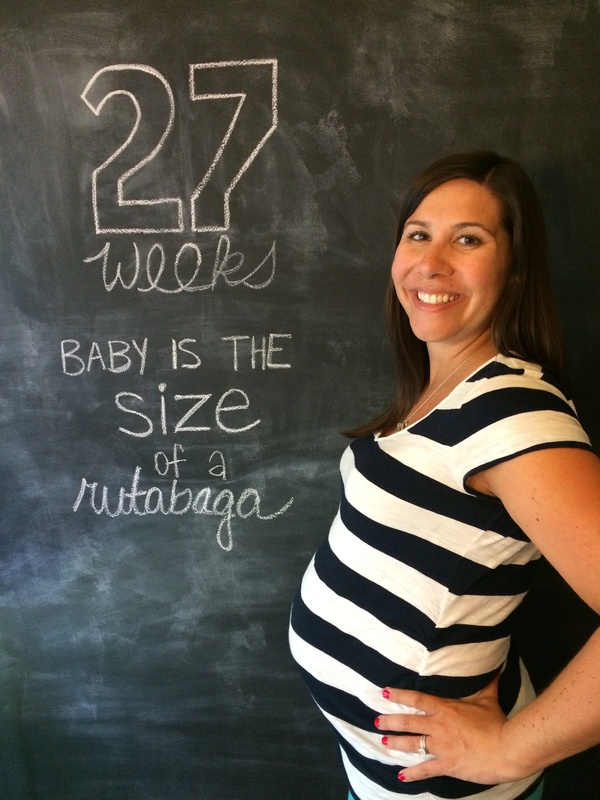 Baby Purchases/Gifts: We have racked up these past two weeks! My sweet aunt brought the most adorable beach rompers and hat for baby girl to wear during our next annual beach trip, and they are too precious for words. My friends also gifted us with a couple of sweet goodies this past weekend – a hooded towel and a personalized diaper caddy liner. We bought a couple of small items including a precious pink Rosemary Beach onesie, a tiny Mike Mulligan and the Steam Shovel t-shirt (can’t believe we found that! ), and a baby book. I ordered a rug for the nursery, too, and can’t wait to start decorating in there once we get a couple of other house projects taken care of. Looking forward to: My next dr appointment tomorrow! 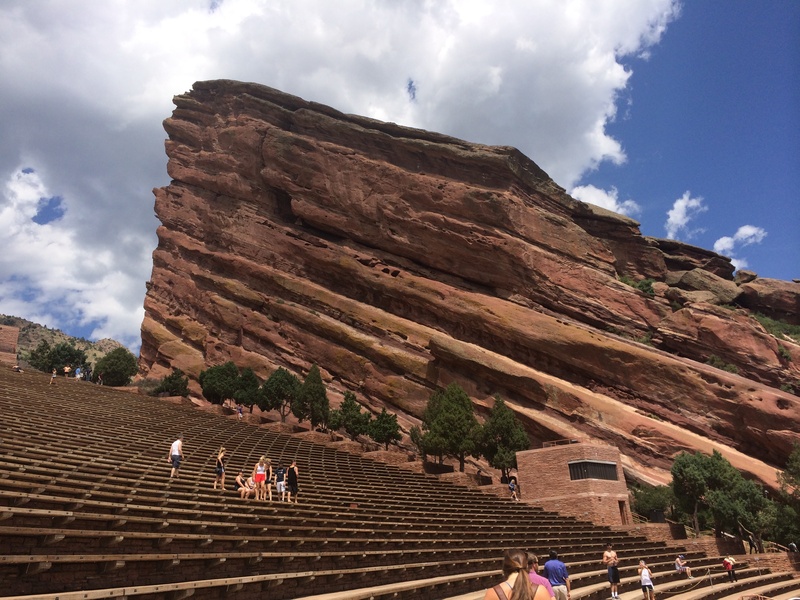 Here are a few pictures from our vacation – Enjoy! 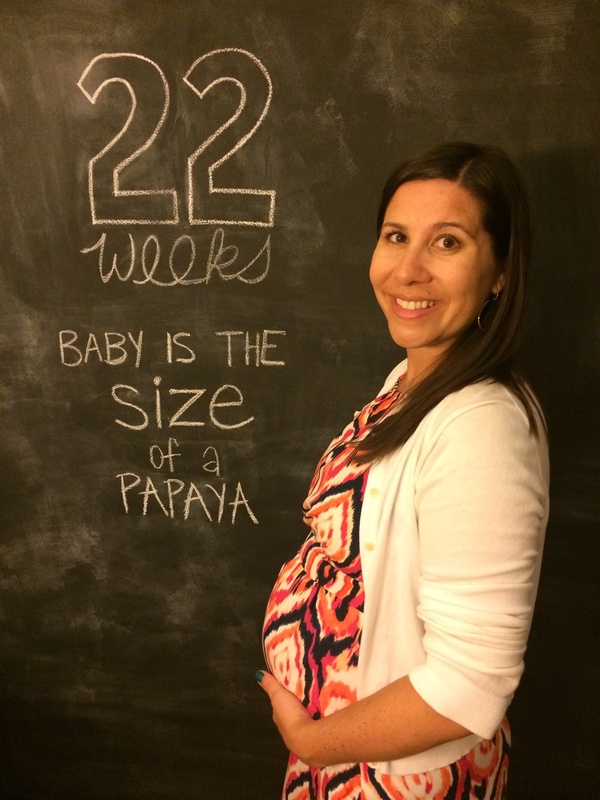 How far along: 22 weeks and the size of a papaya – about 10.5 inches long and 12.7 ounces. Please ignore the bags under my eyes – this picture was taken after a very long day! 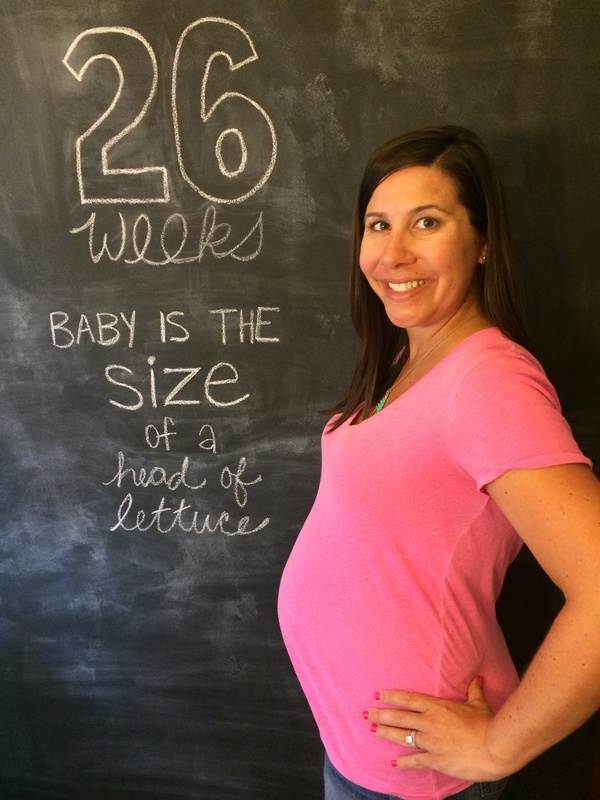 Maternity clothes: This past week I’ve stocked up on a couple of swimsuits for a family beach trip we are taking in a couple of weeks – can’t wait! I didn’t think I’d be the “tankini” type, but I do feel a little more comfortable in them now that my belly is rapidly expanding. Sleep: Starting to become a little more uncomfortable, but that Snoogle body pillow has been my savior! Best moment this week: Feeling real kicks finally!! It’s so weird and amazing. This is one active little girl! I can now feel her kicking at all hours of the day. Mike hasn’t felt it yet since it’s so sporadic, but I’m sure he will very soon. We also enjoyed a wonderful weekend with my mom and Andy who helped us with a big house project – expanding our master closet! It’s not quite complete, but we’re hoping to finish it this weekend and I can’t wait! 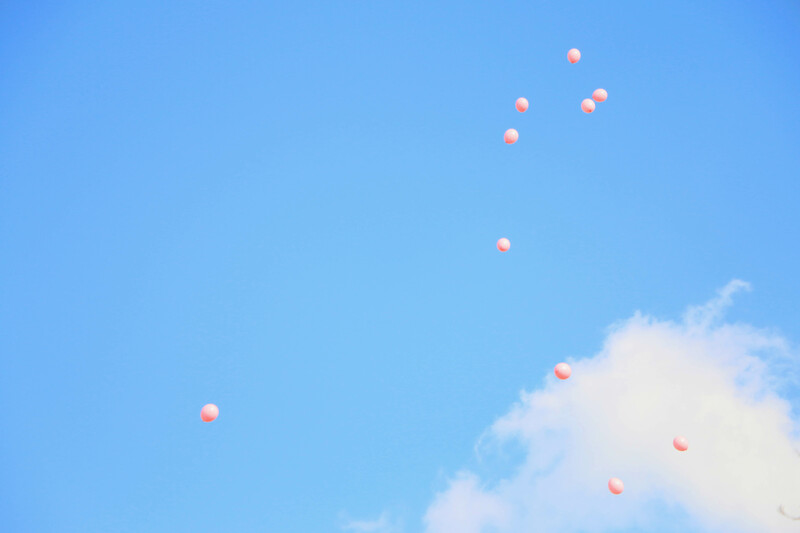 Miss anything: Today I was really missing energy. I’ve been feeling good for the most part, but every now and then I just feel exhausted. Today was one of those days, and I was having to really concentrate on staying awake driving into work. Cravings: Loving summer fruits still – cantaloupe, strawberries, watermelon, and Georgia peaches have been hitting the spot this week! Baby Purchases/Gifts: I bought a picture frame for the nursery today, and I am so ready to start collecting everything else for this sweet little girl’s room! I already have a plan, and I can’t wait to share it once it all comes together! 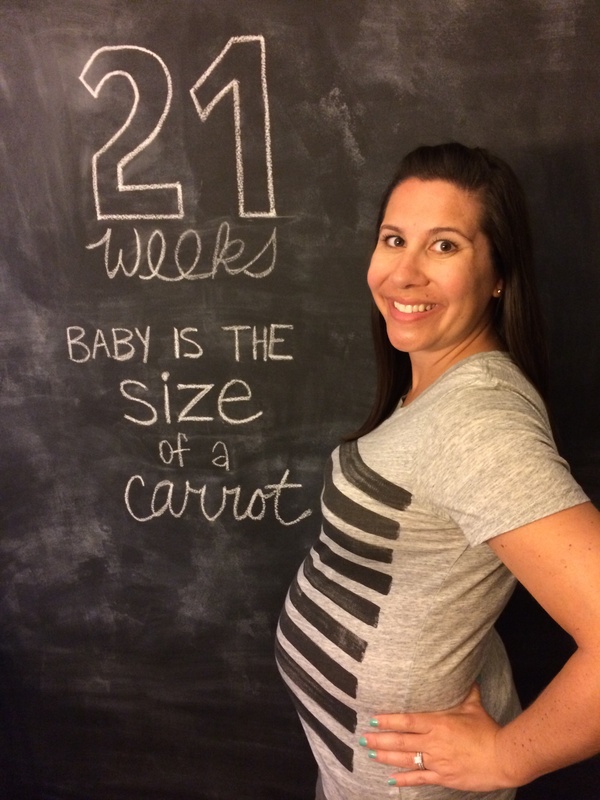 How far along: 21 weeks and the size of a carrot – about 10.5 inches long and 12.7 ounces. 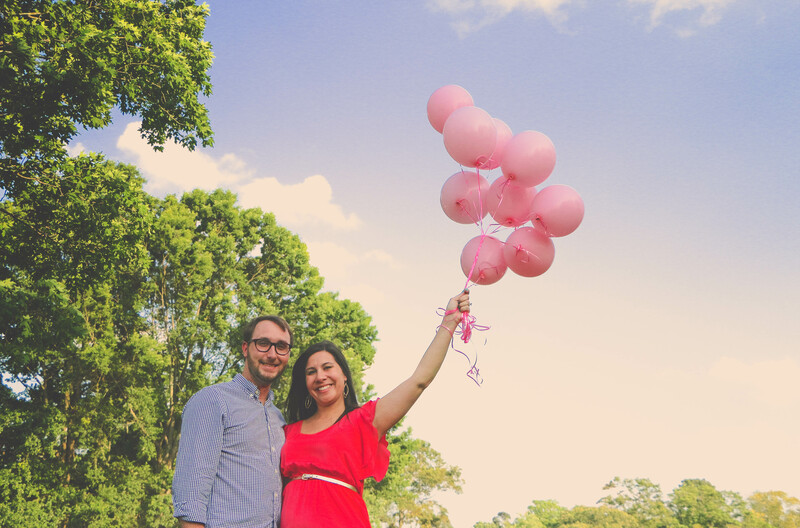 Gender: It’s a GIRL! It’s so funny, but the past week or two I was just feeling absolutely positive that it was a girl – there was no doubt in my mind. I didn’t want to say that out loud in case I was wrong, but I would have been shocked if it was a boy. I just knew! We are so very thrilled, and I already feel more connected with her just knowing the baby is a “she”. 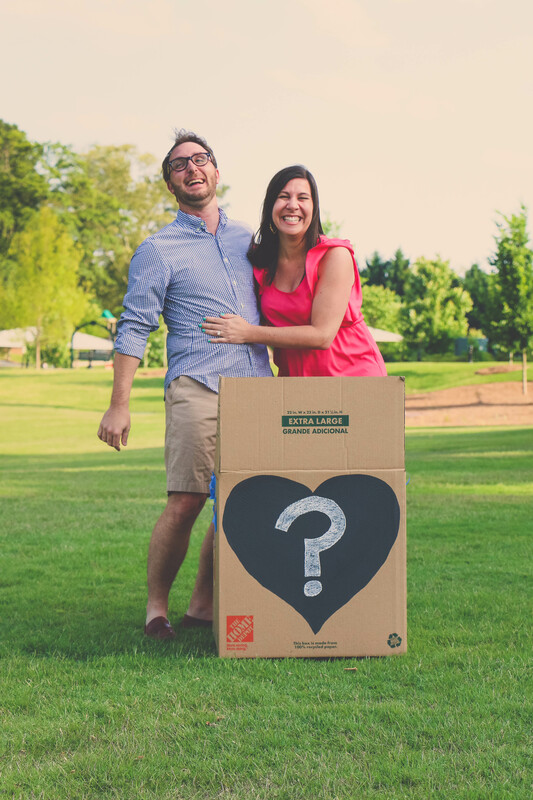 We didn’t actually find out the news at our ultrasound appointment (yes, that was almost impossible to resist!). 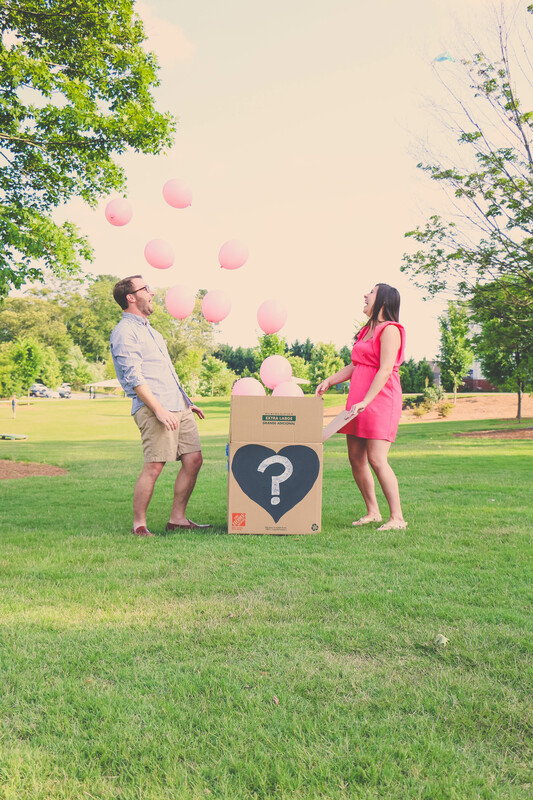 Instead, we had the technician put the surprise in an envelope, and we had some fun with a gender reveal photo shoot that evening. My friends Carson and Melissa were given the envelope and helped set everything up before Melissa took the pictures of us finding out the exciting news! We had a blast, and I’m so glad that we will have these pictures to treasure for years to come. Thanks so much, Melissa!! 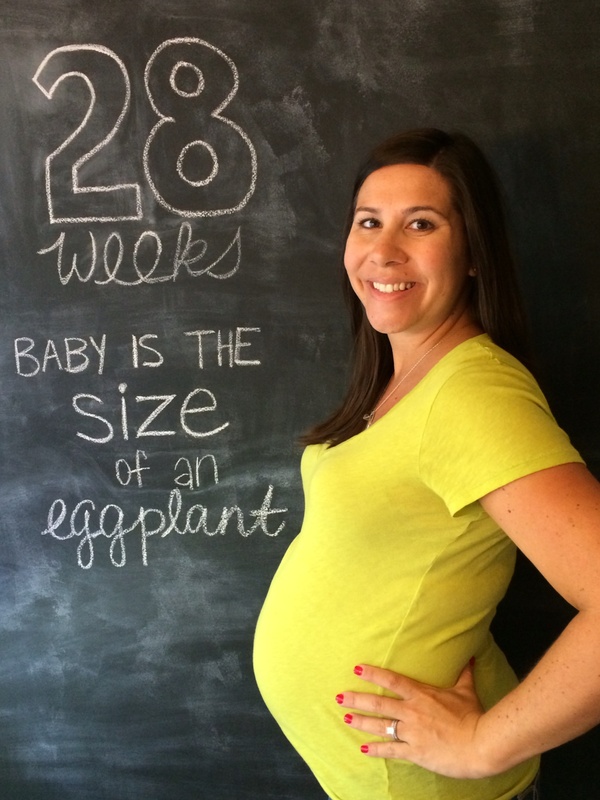 Maternity clothes: YES. I need to go shopping asap because I am quickly outgrowing everything in my closet. Still on the hunt for some work clothes to get me through the next few months. 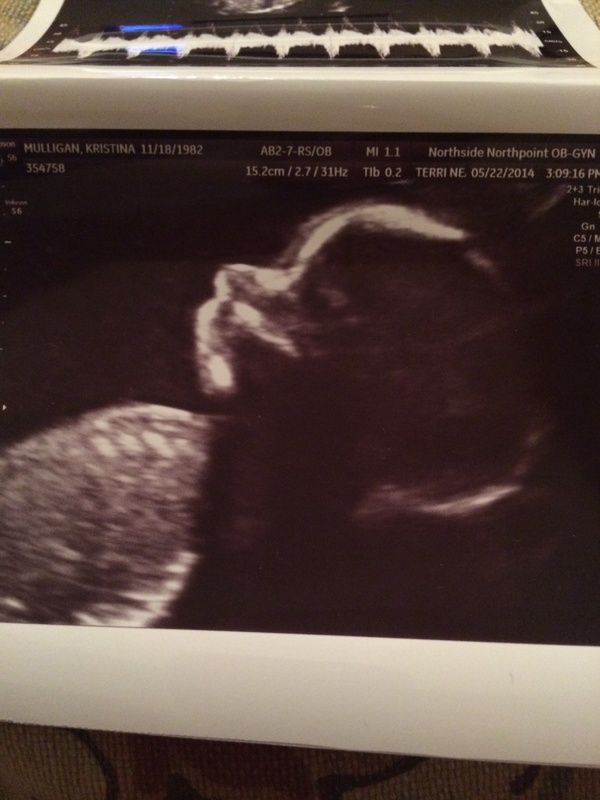 Best moment this week: Obviously, seeing baby girl and finding out the gender was the best!! Also, spending the long weekend at the beach with our good friends Rhett and Katie. 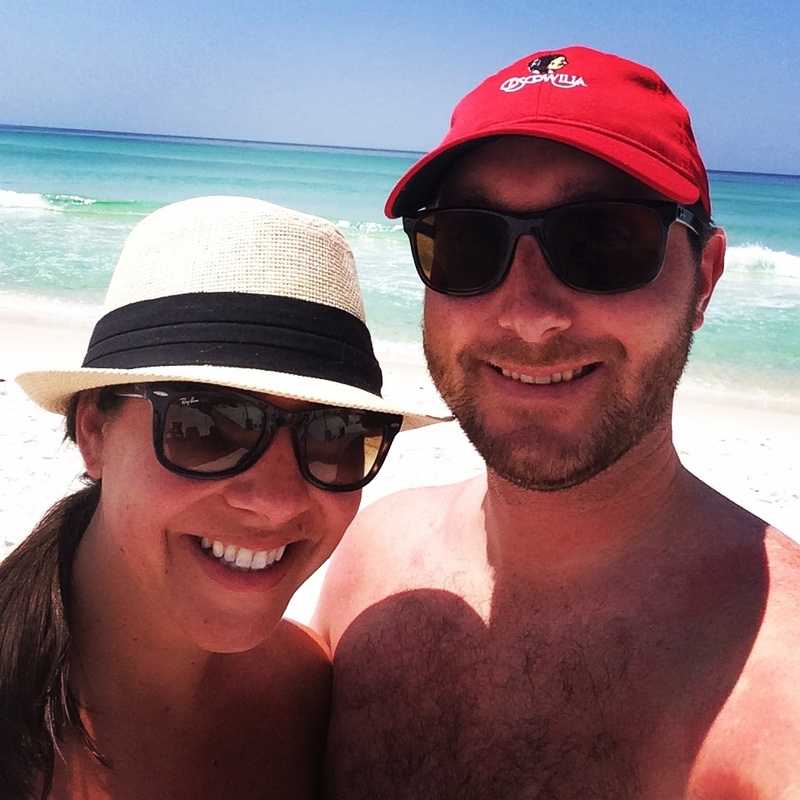 We had so much fun, and it was nice to just relax for a few days and enjoy the sand and salty air – my happy place! Miss anything: Not having to use the restroom at least every hour. It was not a fun car ride home today! Movement: Still lots of flutters all the time. At the ultrasound Baby Girl was moving all over the place which was so cool to watch! I thought that’s what was going on from what I feel every day, but it was neat to see her actually moving about. She was waving her arms and wiggling all over the place. The technician asked if I had just has some chocolate since she was going nuts, and I had to confess I had just consumed a (virgin) margarita at work during a Mexican fiesta lunch we had for a coworker. I guess that sugar really got her going! Cravings: Cantaloupe!, strawberries, chocolate, jalepenos. Baby Purchases/Gifts: Rhett and Katie gave us a sweet gift before our beach trip – an adorable elephant “lovie” security blanket, “It’s a Girl” pin with a Georgia “G”, and a sweet book – so thoughtful! Looking forward to: A short week at work and spending this weekend with my mom and Andy! 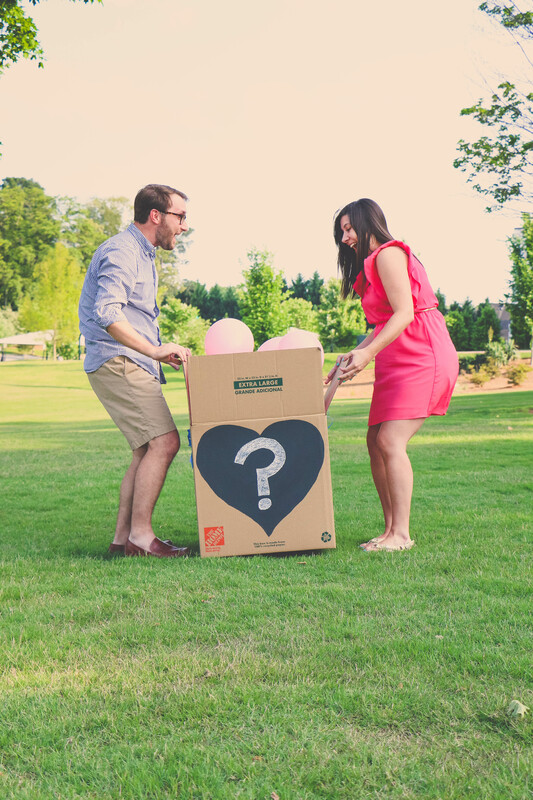 Here are some photos from our gender reveal photo shoot – Enjoy! 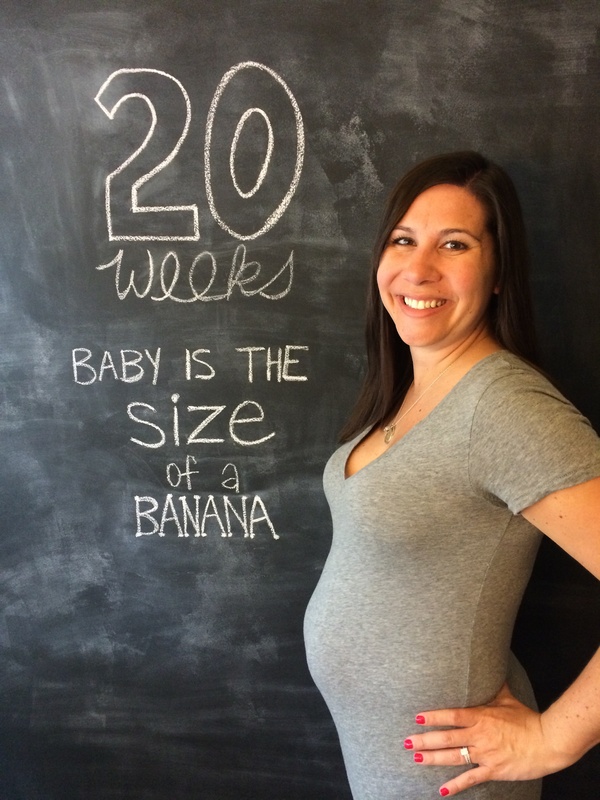 How far along: 20 weeks and the size of a banana – about 6.5 inches long and 10.6 ounces. 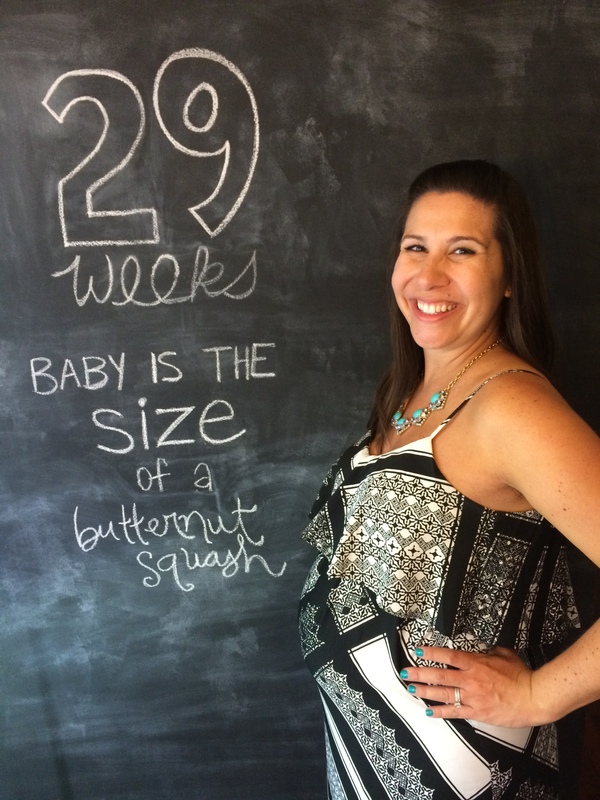 Can’t believe we are already halfway there! Gender: Less than a week until we find out and I. Can. Not. Wait. 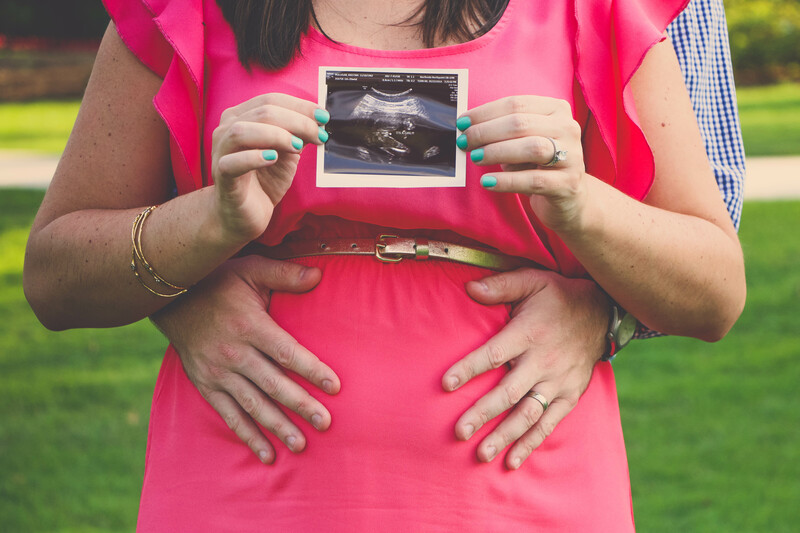 We have our 20 week appointment Thursday afternoon, so fingers crossed that Baby Mully cooperates during the ultrasound! Otherwise, I may have to chug some sugary drinks or do some jumping jacks to try and get him/her to flip around for us (or so I’ve heard…). 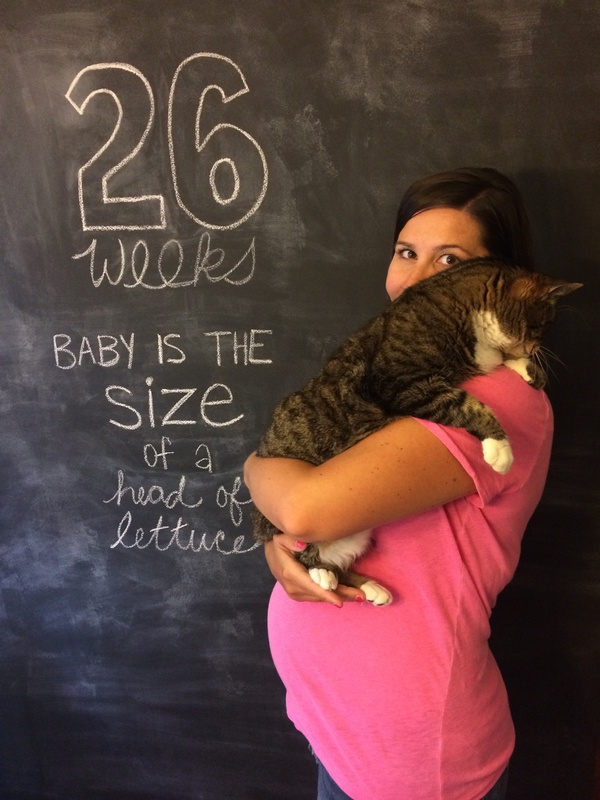 Maternity clothes: I added some maternity shorts, a dress, and a shirt to the wardrobe this week thanks to a crazy sale at Old Navy. Sleep: Usually great, but it’s starting to get slightly more uncomfortable. My Snoogle body pillow has really started coming in handy lately – loving that thing! Best moment this week: Celebrating my good friend Dave’s engagement at a shower thrown for him last night. 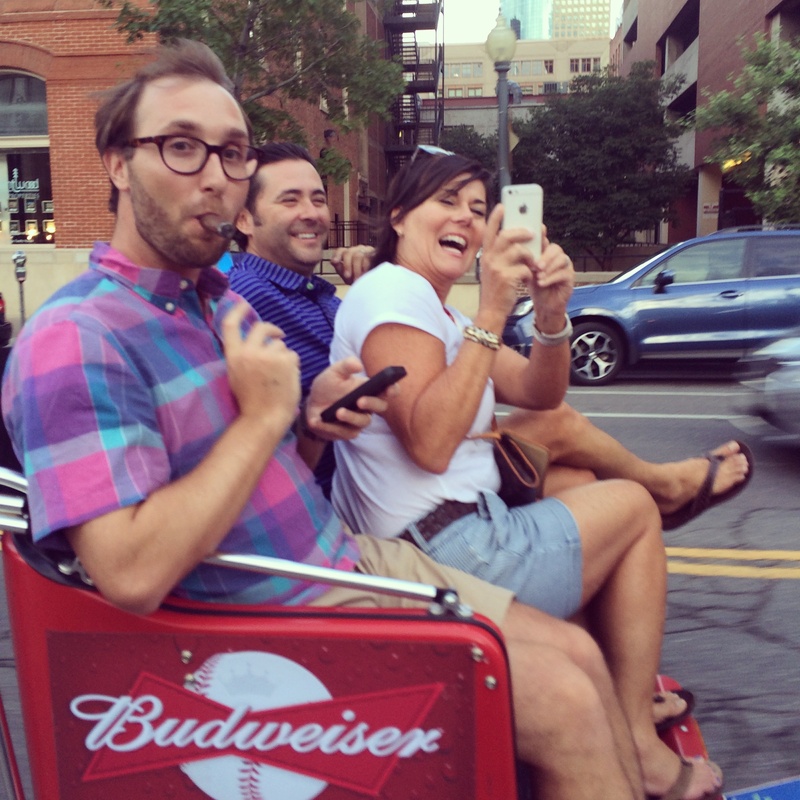 It was so much fun catching up with some old friends and his adorable parents last night. Miss anything: Being able to stand on my feet for longer periods of time without getting so tired and feeling like I’ve just run a marathon. Both the party last night and running errands today wiped me out. I feel great, but I’m often reminded that I don’t have the energy that I used to. Movement: Feeling a lot of movement this week.. mainly at night still. It’s getting much more prominent, but I’m still waiting on that first kick! Cravings: Fruit, chocolate, and spicy foods. 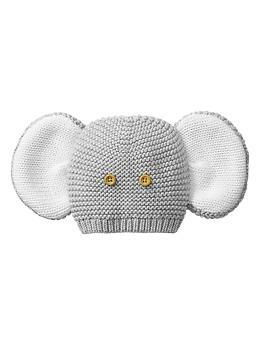 Baby Purchases/Gifts: My sweet friend Tara and her husband Jarrett gave us this adorable elephant baby hat last night, and I’m in love with it! It will be so perfect for baby’s first fall and winter. I also loved Tara’s sweet note that she wrote to us giving us one piece of advice – ignore the advice and follow your instincts. I miss that girl and wish I saw her more often! 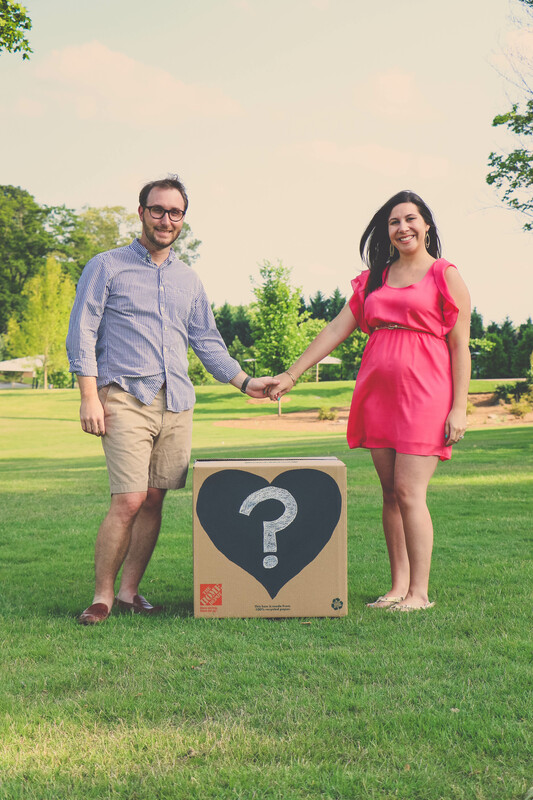 Looking forward to: Finding out the gender this week!! Also, we are spending Memorial Day weekend at the beach with our good friends Rhett and Katie. I can’t wait for a fun weekend relaxing in the sun! 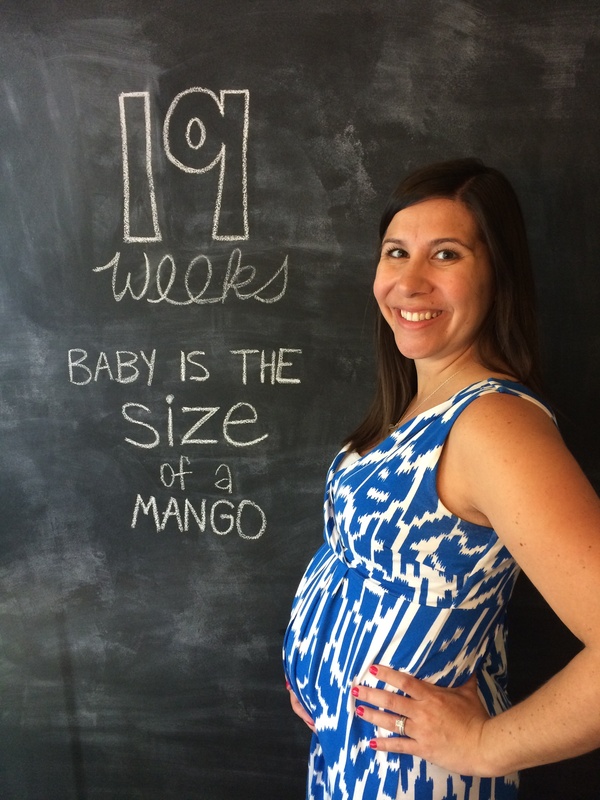 How far along: 19 weeks and the size of a mango – about 6 inches long and 8.5 ounces. Gender: I feel like there are now mixed reviews from family and friends, but I’m still feeling girl. 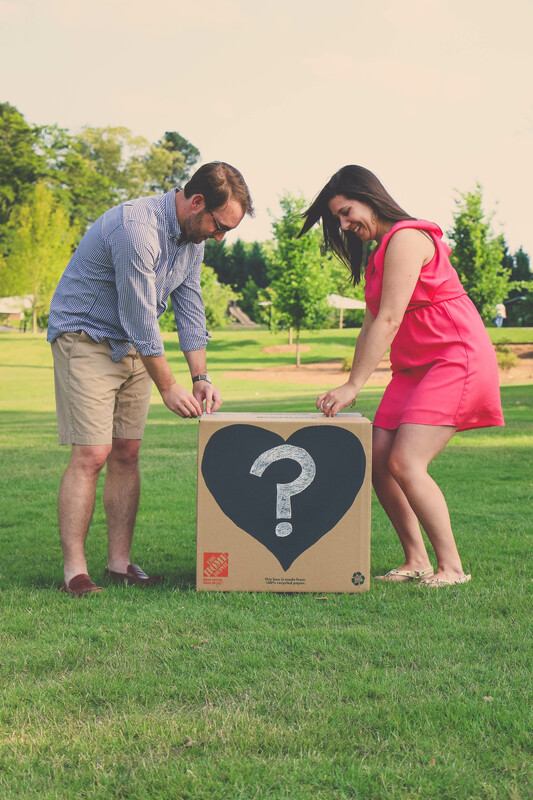 11 more days til we find out! 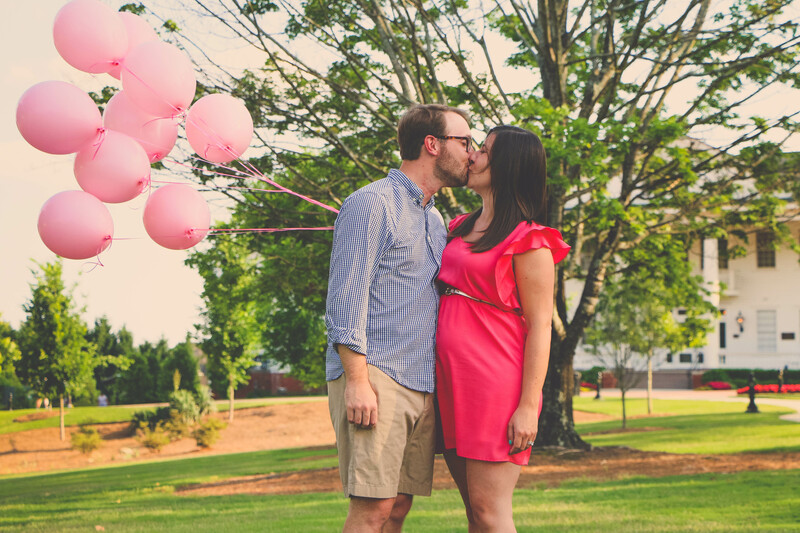 Maternity clothes: 90 degree temps are here in GA, so I am living in stretchy, breathable dresses as much as possible. 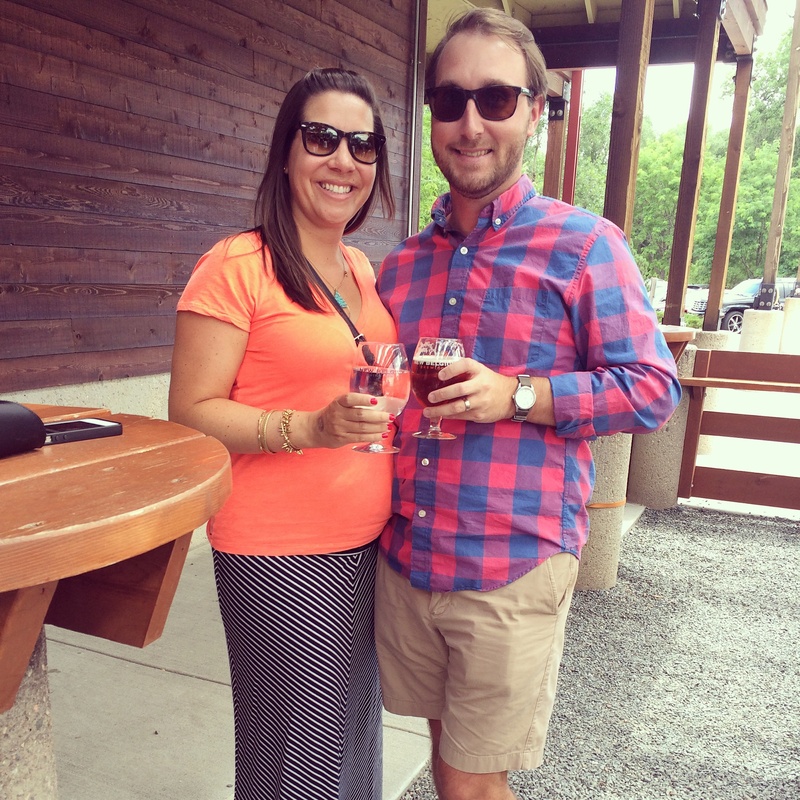 I’m also still loving the maternity jeans and shorts. I need to add some work appropriate tops to the wardrobe soon, but I haven’t found any I really like. 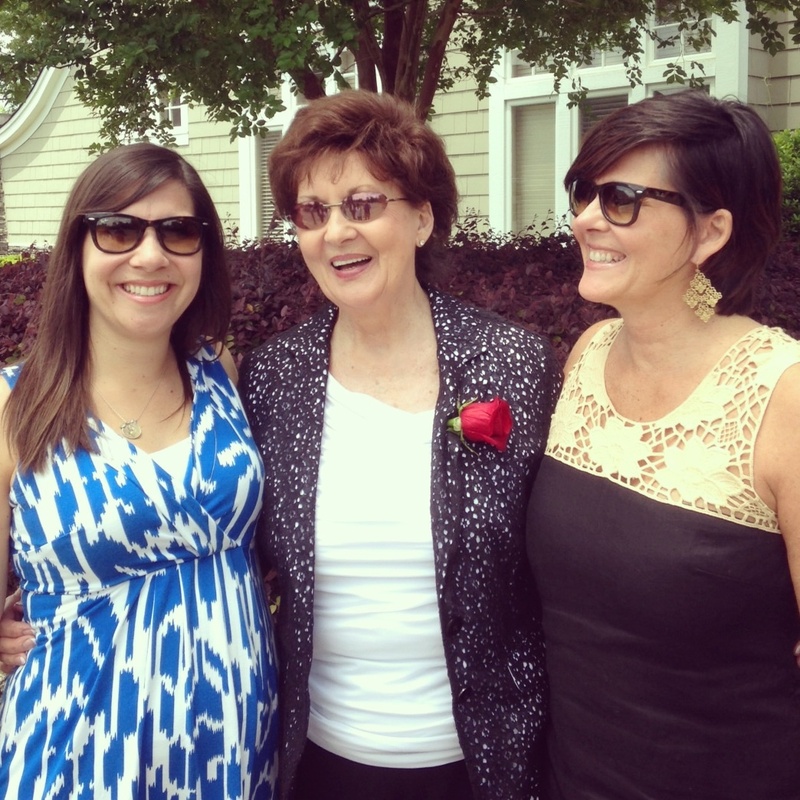 Best moment this week: Celebrating Mother’s Day with both my mom and and my mother-in-law for the first time ever! It was so nice having both of our moms together for such a special weekend. We had a great time, and I can’t believe that this time next year I will be celebrating my first official Mother’s Day with a 7ish month old… crazy! Movement: Still feeling a lot of movement especially at night and when I eat spicy food. 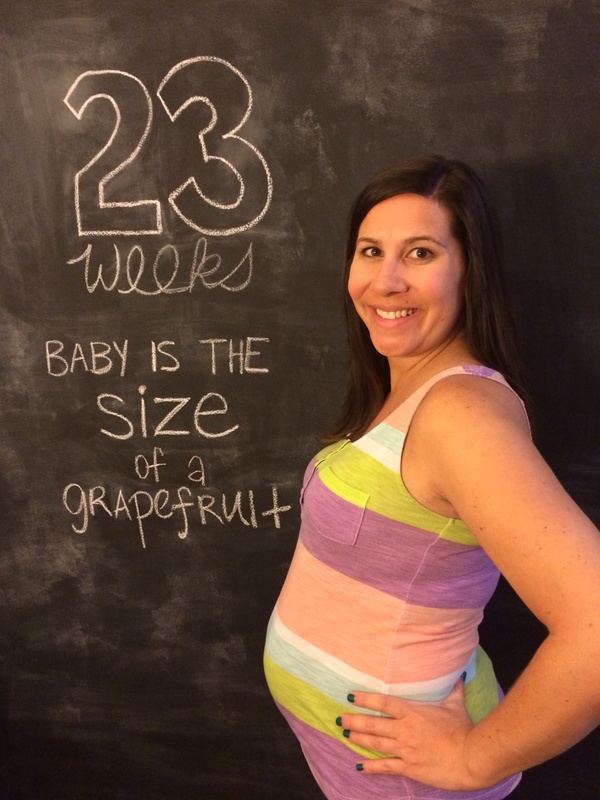 Cravings: Fruit, chocolate, and I’ve been eating a lot of spicy food this week… hence the dancing baby in my belly! Baby Purchases/Gifts: We bought our first piece of furniture for the nursery this weekend which I am so excited about! It’s a dresser that will also be used as a changing table. It’s absolutely perfect, and I was so happy to find it while out shopping with my mom and MIL. It was a sweet moment to share with them! We also got a couple of sweet gifts for Mother’s Day… a red & black pair of booties from my aunt (Go Dawgs!) and a cute canvas painting for the nursery along with two adorable onesies from our brother and sister-in-law. So sweet! 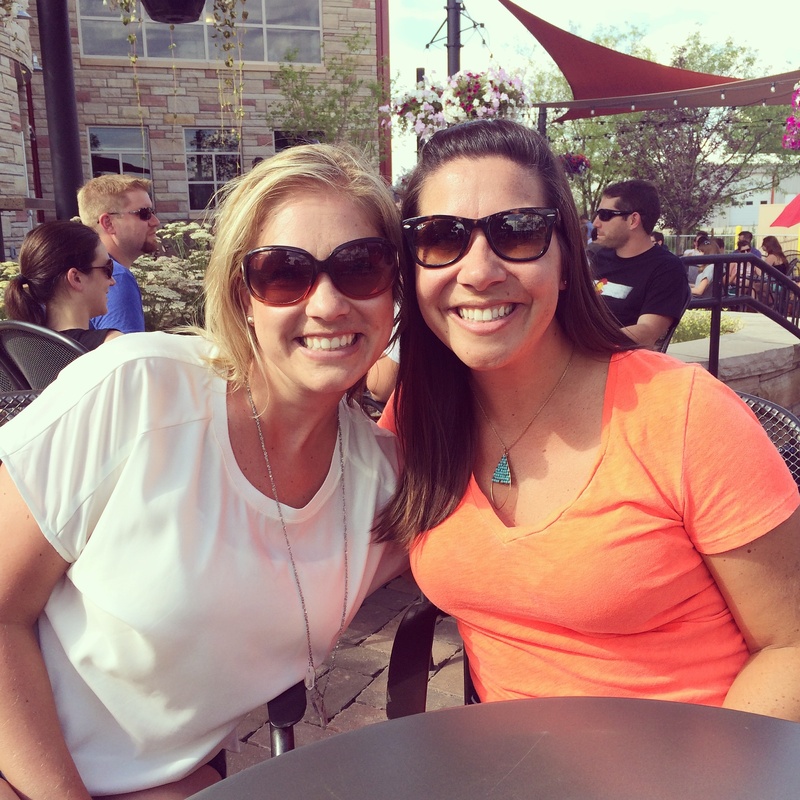 Looking forward to: A low-key week and then celebrating a good friend’s engagement next weekend! Happy Mother’s Day to all of the mothers and moms to be out there! !